Mabel M. Burton, 95, of North Franklin Street, Port Washington died Thursday, July 17, 2008 at Cedar Grove Gardens, Cedar Grove, Wisconsin. 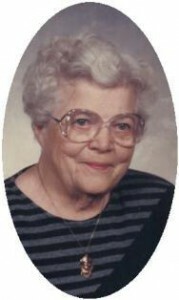 She was born on June 10, 1913 in Stockbridge, Wisconsin to Joseph and Mary Thill Olig. She graduated from St. Mary’s Academy High School, Milwaukee and St. Agnes School of Nursing, now Marian College in 1933. She was a nurse at St. Agnes Hospital in Fond du Lac for a few years. On May 21, 1938 she married Harry N. Burton of Port Washington at St. Mary’s Church in Stockbridge. She and her husband started Harry’s Restaurant on Franklin Street in 1944. She continued to reside upstairs and enjoy daily “tea-time” with her friends until recently. She will be remembered for her cooking and baking, especially her Jewish coffee cake, still made from her recipe to this day at Harry’s. They sold the business in 1978 and Harry preceded her in death on October 5, 1980. She was a member of St. Mary’s Parish and Christian Women and the National Restaurant Association. She enjoyed cheering for her Packers and crossword puzzles. She is survived by her children Sue Croatt of Port Washington, Harry (Jane) Burton of Williamsburg, Virginia and Michael (Gail) Burton of Los Angeles, California; six grandchildren Deb (Randy) DuFour of Port Washington, Dennis Croatt of Kiel, Lisa Croatt of Belgium, Shannon (Matt) Dutriaux of Princeton, New Jersey, Suki (Jake) Hovermale of Reston, Virginia, and Nicholas Burton of Bridgewater, New Jersey; six great-grandchildren Miranda DuFour, Jake and Kiley Croatt, Trevor Schumacher, Ella Marie Hovermale and Lucas Dutriaux; sisters-in-law Lillian Swatek of Port Washington and Caroline Miller of Milwaukee, other relatives and friends. She is preceded in death by her husband, daughter Rita Burton and son-in-law Dennis Croatt. A Mass of Christian burial will be celebrated at 6:30PM Monday, July 21, 2008 at St. Mary’s Catholic Church, Port Washington. Reverend Tom Lijewski will be the celebrant. Interment will take place in the parish cemetery. Visitation will be from 4 to 6 PM Monday at the Poole Funeral Home, Port Washington with at 4 PM Rosary. emorials to the St. Mary’s Endowment Fund appreciated.